Making the transition from studying in Zimmerman Library to laughing so hard it hurts at Empire Board Game Library is easy when it comes to friendly competition and good times. 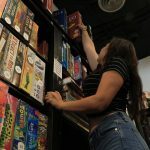 Just a short walk from campus in Nob Hill, cozy up and battle out who the true meme queen or king is, who can best rule ancient Egypt, ward off some zombies, and more; there are literally hundreds of games to choose from! From the “Dukes of Dice” reuben, a perfect combination of pastrami, sauerkraut, green chile, swiss cheese, and thousand island dressing, to decadent strawberry cheesecake or brownies a la mode, or simply just a bottomless cup of local Michael Thomas coffee or ginger peach iced tea, Empire Board Game Library is the perfect place to kick back, relax, and spend a few hours in another world. Activity: Pay as you play board games plus sandwhiches, desserts, espresso drinks, and more! There's nothing more fun than a round of games and snacks here!